This topic contains 9 replies, has 4 voices, and was last updated by MaggieH 4 years, 5 months ago. 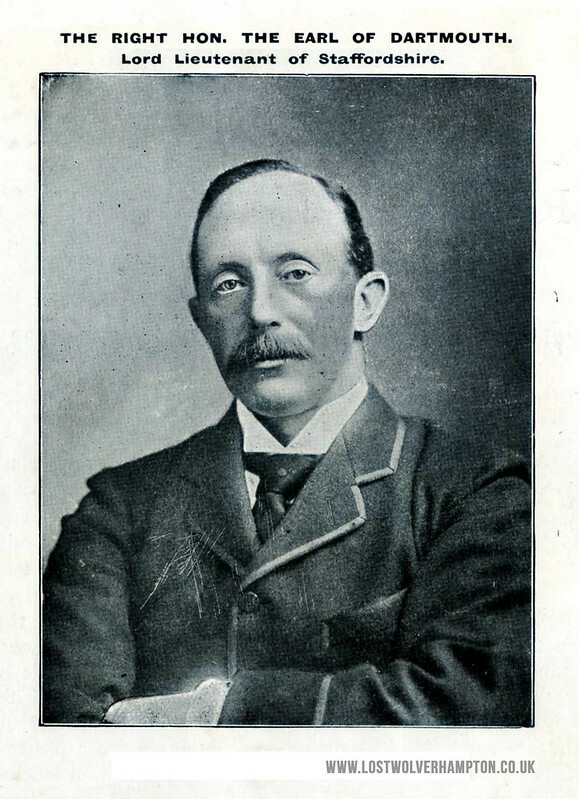 Born 6th May 1851, Westminster London. Died 11th March 1936 (aged 84) at Patsull Hall, Staffordshire. Political Party, Conservative. Spouse, Lady Mary Coke 1849-1929. Now thinking about Inns, named after local gentry in and around Wolverhampton you probably know at least two connected with this gentleman ie. The Dartmouth Arms Burnhill Green or perhaps the one closer to town with the same name in Vicarage Road, All Saints. Both of these are stilling pulling pints today. But there was another Public House with connections through the title of this gentleman still standing but unfortunately not trading today. Can you name it and its location ?. The Duke’s Head on Duke Street? No Tony not the Dukes Head -But it is a Public House on a Street in Wolverhampton the name of which more in keeping with the gentleman himself. Perhaps a clue is needed here? Greenaway playing fields, opened in June 1931, were given to the people of Bilston by Mr JL Greenway. It was noted that the opening ceremony was performed by the president of the Staffordshire Playing Fields Association, the Earl of Dartmouth, the Hon Humphrey Legge, DSO, DL. Son of the Gentleman pictured above. On the 20th of June 1935 a similar ceremony went on in Wolverhampton when the Sir William Henry Fowler, Playing Fields were opened by the present Earls sister, Lady Joan Legge. Perhaps “Fowlers Park” as its known today may bring the answer to the whereabouts of this former Public House closer to home. Well, I grew up near a Fowler Street, and there were playing fields just off to one side, up the hill from Villiers works. In fact they were, if I remember correctly, known as Villiers fields when I was at school there, and the local junior school (St Luke’s) used them as their playing field. Probably barking up the wrong tree. Am trying to think what the nearest pub would have been – the one in Cross Street? Sorry Maggie my fault . I expect everyone to know the whereabouts of places in old Wolverhampton as well as I do. I should have mentioned that “Fowlers Park” was and still is situated of the Cannock Road. the entrance of which was at the side of The Wagon & Horses. The Railway tracks and the canal ran alongside the western edge of it. Part of the eastern edge bordered Nine Elms Lane which also led off the Cannock Road. 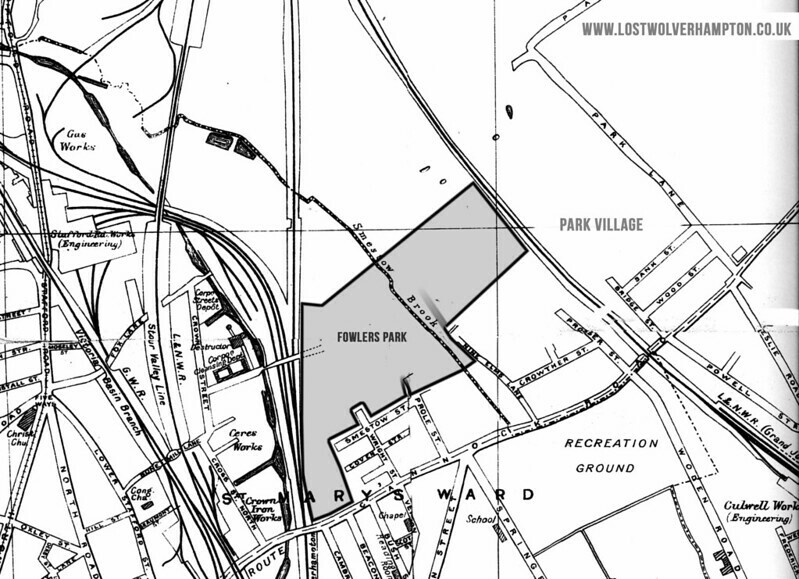 This is my impression of “Fowlers Park” and the adjacent area circ 1940. OK. Time for my two pennies worth. Which even in the bad old days would get you a piece of liquorice wood and bag of a Kali. 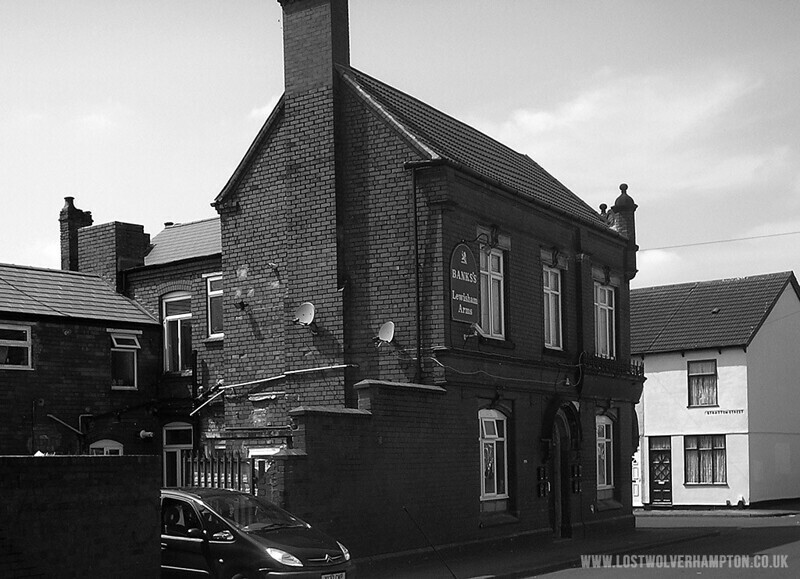 The Paget Arms, Park Lane. After looking at the list of defunct Wolverhampton Pubs it seems to be the only Pub with a Heraldic Pub Sign that is related to another local family. I don’t count the Masons Arms in Water Street as I take this to be the old Square and Compass which relates to the Order of Freemasonry. The Dartmouth Arms as you point out Bill, relates to the Earl of Dartmouth, whose local family seat was Patshull Hall. The Paget Arms refers to the Marquess of Anglesey who, as the original Sir William Paget was summoned to Parliament in 1553 as Lord Paget de Beaudesert. This was one of the family homes and is quite close to Cannock Chase. The First Marquess of Anglesey, Henry Paget, gained fame at the Battle of Waterloo where The Duke of Wellington defeated Napoleon Blownapart. Sorry Bill, I couldn’t resist that one. The connections a bit nebulous but the best I can come up with this time of night. Nice one George, and this is what this “Puzzle Corner” is all about. It doesn’t matter wether or not anyone solves these little riddles. If this little weekly Quiz helps people discover small, perhaps to some; irrevalent bits of Old Wolverhampton. To me thats everything. The building is still standing on the corner of Prosser Street and Stratton Street, Park Village. No problem, Billy – I did say I was probably barking up the wrong tree! Having grown up in the south of the Borough, I was never very familiar with the North bit of town. Plus I’ve not lived there since the mid-sixties. As you say, it’s all a bit of fun.